Dear reader, surely you are desperate for someone to impose some structure on your culinary life. I am writing this short message to assure you that I have not forgotten about you. It's just that I have been very busy over the last few months. Among other things, I have been consumed with making sausages and showing other people how to do it. I recently gave a workshop on this very subject. You will view the photographic evidence found here (courtesy of my friend and workshop co-organizer Natasha Pickowicz). 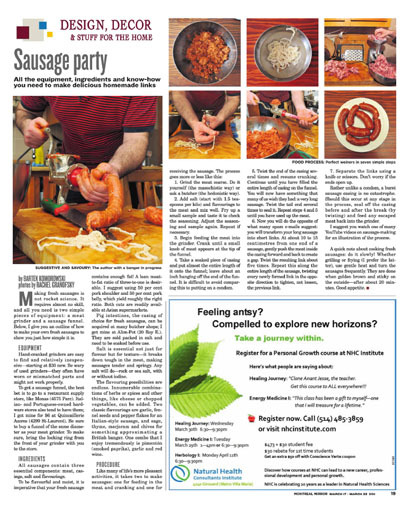 You will also read the short article about making fresh sausages that I just published in the Montreal Mirror. The structure you desperately need will be put into place soon: a second Culinary Propaganda video, along with an instructional article, is about to drop - stay tuned. In the meantime, good appetite. condom jokes: always appropriate. well done! love this piece. You can also add other meals to the party. It depends on your preferred taste for sausage. First time I am visiting to see your blog you have written.